Cardinal Vincent addressed the CSAN Parliamentary Reception on 5 November 2014 in the Terrace Pavilion in the House of Commons. The annual event was this year hosted by Eric Ollerenshaw MP with addresses from the Cardinal and the Rt. Hon. Eric Pickles, Secretary of State for Communities and Local Government and Minister for Faith. It was attended by over 170 parliamentarians and representatives from leading Catholic charities and faith-based agencies. In his address, the Cardinal called on MPs and Lords to learn from the Church’s hands-on approach to tackling the reality of poverty in the UK through its many charities, such as CSAN, the SVP and the Cardinal Hume Centre. As well as addressing the wider concerns, the Cardinal also spoke of the impact of zero-hours contracts, the limitations of a minimum wage and the discrepancy between incomes and basic living costs, stating that work must be properly paid if families are to find a way out of poverty. He finally thanked CSAN and its partners for the ‘extraordinary work’ that they do across England and Wales to improve the lives of many thousands of people. 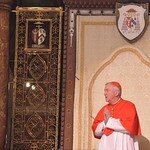 The Cardinal’s address can be read in full HERE.